Hill start assist is activated when you start the Jeep Cherokee from a stopped position on a hill. It maintains brake pressure for a short period of time after you release the brake pedal and step on the accelerator to begin moving forward. That way, your vehicle will never roll back. 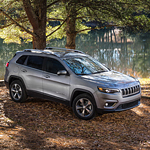 If you go with Trailhawk, which is the off-road-optimized version of the Cherokee, you will also get hill descent control. This feature helps you maintain a safe vehicle speed while descending hills during off-roading. You won’t even need to brake when hill descent control is working.